Majesty was something of a disappointment. It’s not that it’s a bad game, it’s just that it’s a game that I don’t think is remotely necessary. It lacks drive, imagination, and any selling point other than ‘we kinda have chips like Splendor did’. We gave it two and a half stars in our review, which is I think ample for something which meets the minimum requirements of functioning adequately as a game. Not only would I not miss it if it left my collection, I probably wouldn’t even remember I ever had it without some very effortful prompting. ‘About assigning villagers to locations in a village’, they’d continue. ‘Terra Mystica?’, I’d reply with an uncertain lilt in my voice. And so it would go. Perhaps it’s going to do itself more honour in the accessibility teardown. Draw your blade, my liege – defend yourself. While many of the cards have similar colour palettes, no information is lost as a result. Every location card has an icon, written text, and identifying imagery. Any one of those would be enough to make it accessible, and the combination offers a degree of redundancy that is very pleasing. This is also true of the villager cards, which make use of unique art and icons to differentiate them. There’s only ever going to be six of those anyway and as such even were the game not accessible in this way it would still be possible to play with easy support from the table. 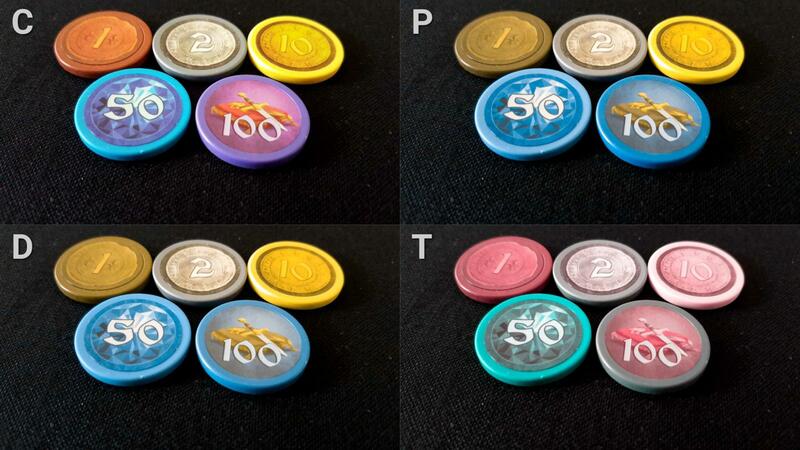 Tokens too are fine, offering as they do iconographic and numeric information to supplement the colours. 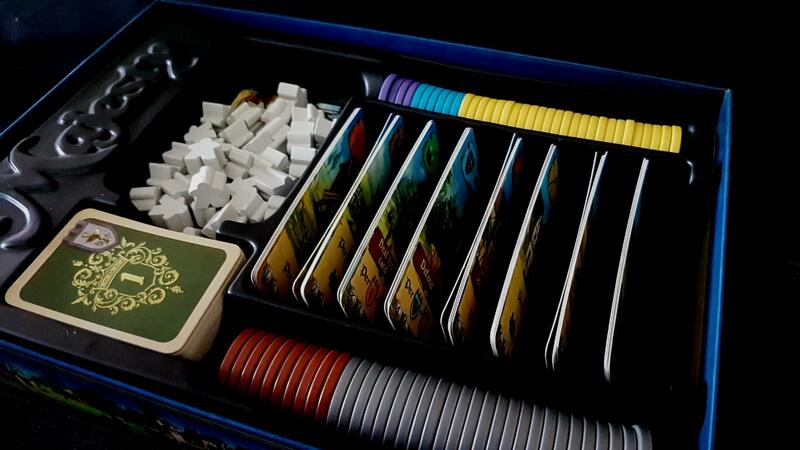 The chips that you’ll use during play are very tactile, but they’re only differentiated by number and colour. There’s no way to tell them apart by touch. You can at least count the number of workers you have available, and how many are on each card, through tactility alone. Everything else is printed on the cards, and that’s an issue. It’s not however an insurmountable one if some degree of visual discrimination is possible with an assistive aid. The game makes use of iconography to compactly represent game effects and the layout of this is (semi) consistent on each card. It’s always going to be along the bottom but some of the locations have especially large sections to encompass multi-part effects. Contrast on these is reasonably good in terms of background and icon, although in some cases it’s not always true in terms of art and information panel. The cards then are reasonably accessible, although with a few issues with regards to setup and end scoring. The card number, set and point total is at the bottom edge of the card and isn’t especially readable – this is a temporary issue though. 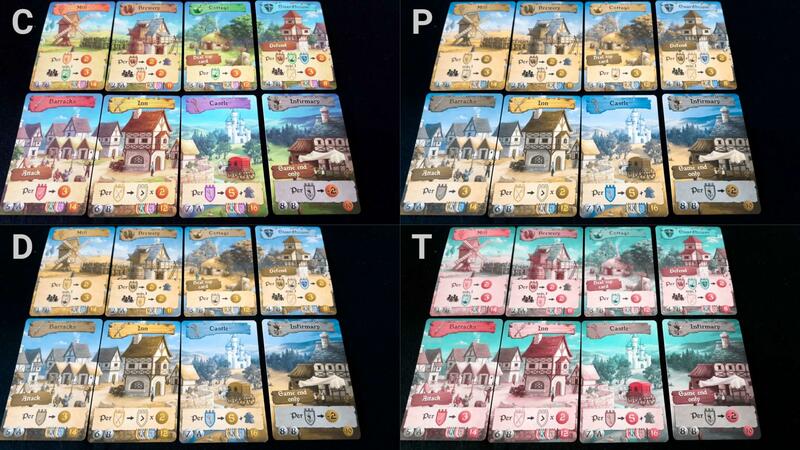 The composition of your village is fixed at the start of the game. Your choice in every round is between one of six possible villagers. Making the right choice here depends, at least in part, on what other people have done. Players can verbalise during their turns, and offer a summary of their village upon request – no intention is leaked by asking for this, or at least not any information that is likely to have a substantive impact on play. That means your choice is largely focused on your own tableau in front of you and that’s amenable to physical inspection. Each location will have a stack of cards that indicates assignment, and careful positioning of the layout of the cards will ease in parsing game state. In this way, even full blindness need not stop someone playing. However, there are still a lot of scoring effects that need to be taken into account and I emphasise again this is going to have a memory cost. 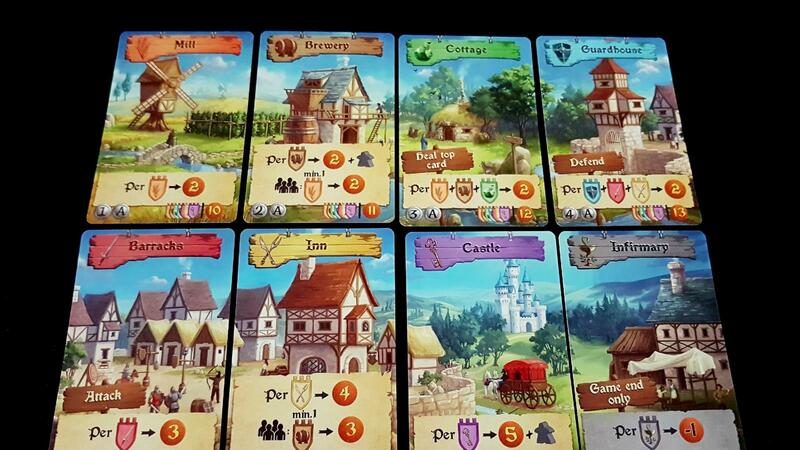 Cards are double sided too, so the composition of a village will differ from one side to the other. Or, if you want to get creative, a mix of sides. I don’t think that’s actually permitted in the rules but I also don’t think it’s prohibited In any case, a group can standardise on a village layout and stick to that. Once that’s committed to memory (or inferred from visual inspection) all a player need to decide on is which villager to purchase. We’ll recommend Majesty in this category. 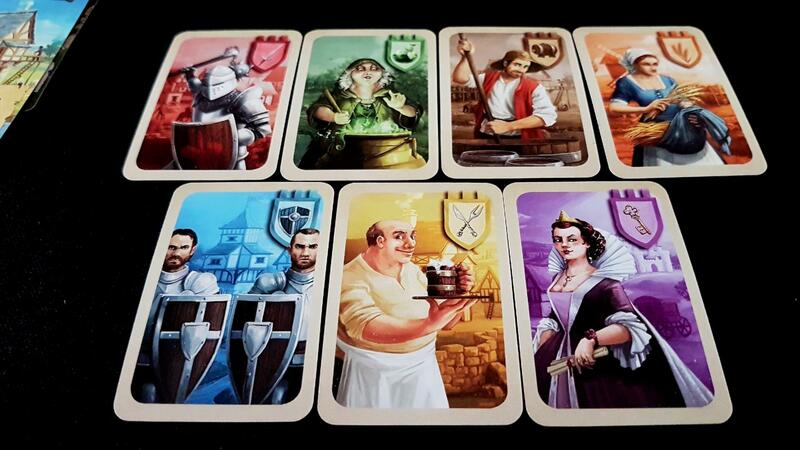 Majesty doesn’t require any literacy – the cards have written descriptions of the locations but these are for flavour. However, it does have an iconographic language that must be internalised. It’s not complex and its constructions are reasonably straightforward but it is going to be an initial barrier that people must overcome. Coupled to this is an ongoing and reasonably heavy expectation of numeracy. No part of it is especially difficult if someone has mastered arithmetic but it does involve summing and multiplying values. Significantly, it will also involve a lot of ‘making change’ with the provided tokens unless an alternative tracking system is swapped in. The lack of a five token here means that this is more of a chore than it should be, and sometimes the job of taking points will involve trying to create a workable sum from the tokens available. Other than this, cards will offer score for meeting certain conditions and this score is then multiplied by the number of cards present, plus any modifiers. None of it is overly complex, but you need to do it a lot. On the positive side though, the game offers a way of scaffolding the cognitive accessibility by offering two distinct village layouts. The A side offers the simplest and most straightforward of these, and the B side is a little more strategically and tactically complex. You can mix and match these too as necessary, and while the game doesn’t come with any suggested combinations for maximum cognitive accessibility you can certainly house-rule a version. 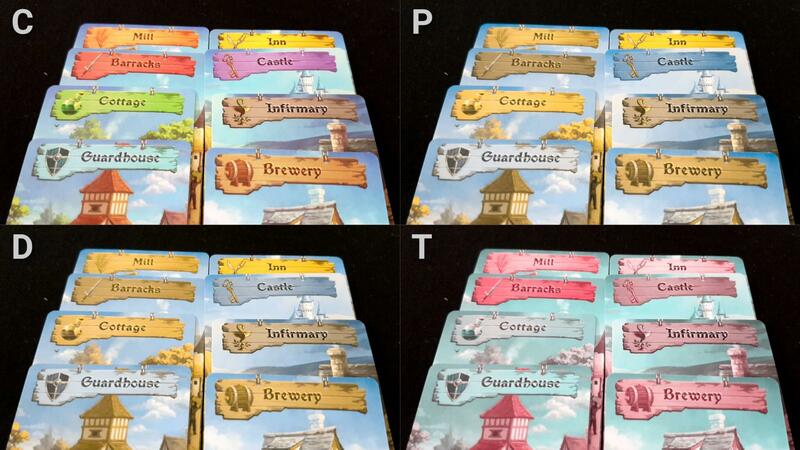 For example, the B side of the guardhouse gives two points for each set of brewer, witch and guard along with everyone receiving three points if they have at least one innkeeper. The A side is simply two points for guards, knights and innkeepers. The most complex effects of gameplay are associated with effects that trigger and offer the rest of the table points as a result. You can finagle that to an extent to simplify the game down to its most straightforward variant. Game state is otherwise not especially complex – six villagers to choose from and the scoring implications associated. Game flow is consistent, and while there are a few special cards that impact on that to an extent (the witch and the knight) they don’t do so for long. The knight results in a comparison of knights versus guards, and the witch results in healing a previously wounded villager. None of it puts an excessive burden on players. There is a degree here to which timing of play will be important but the tactical and strategic layer of the game isn’t especially deep. There are few meaningful synergies because even related cards work primarily on presence rather than intersection of special effects. Still, that scoring is quite cognitively taxing and the iconography that goes along with it doesn’t help. There is at least nothing that needs to be explicitly memorized in order to play well, although it will help to an extent to know how many cards of each type are still to be drawn. Most of what you do though is react to your options rather than influence them so the effect is marginal. 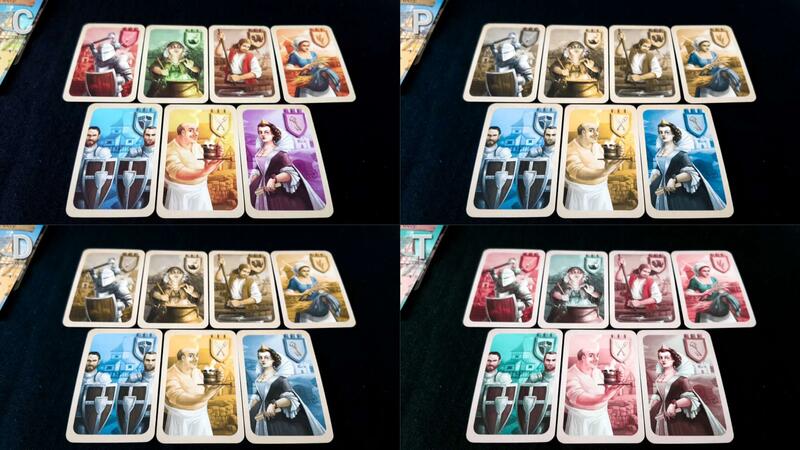 There is an explicit PvP mechanism in Majesty – players selecting a knight card can injure players in other villages if they don’t have enough guards to counteract it. This is such a mild inconvenience that it rarely has any real impact. It’s at its most effective if it’s done just before the game ends to remove majority control from a player at a particular location. Otherwise it does little damage. You need to grab hold of a witch to heal the wounded villager, but they’re abundant in the deck and you still get score for selecting them. You can prevent it entirely by stacking guards in proportion to your most aggressive opponent. Primarily though the reason why this isn’t an especially sharp system is that it’s always the leftmost villager that is sent to the hospital. Your opponents can’t actually attack where you’re weakest, or where your points are most lucrative, and that takes most of the sting out of the whole thing. As long as you can undo the harm by the end of the game, or are happy to concede the villager, it may as well not have happened. The only other potential point of concern here is the final scoring rule which is dependent on having majority presence in a location. It’s entirely possible here that a player will find they go from winning to losing that in the course of a turn without having anything they can do to stop it. If the villagers aren’t available, you don’t get the option. If this happens during the last turn, it can have a significant impact on the score. 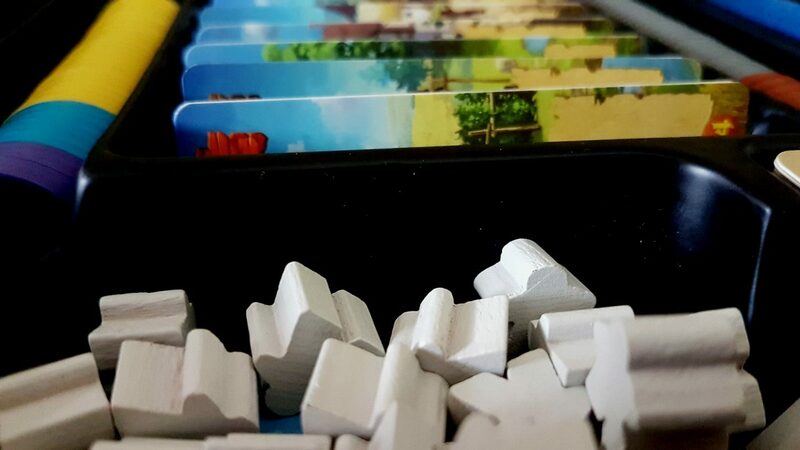 Sometimes a player will find a card they need comes out and is bought before they even get a chance to consider it – the availability of worker meeples means that availability of purchasing power is not necessarily uniform. Other than that, there isn’t a lot of Majesty that’s likely to trigger emotional accessibility concerns. There are no player eliminations, no take-that mechanisms beyond what we’ve already discussed, no upsetting themes and limited ability for players to gang up on another. Even if prevented from taking a card a player might want, there are always broadly equivalent options. Points disparities, as a result, tend to be quite low. It’s certainly possible for one good player to absolutely dominate everyone else but usually only once and then everyone cottons on to the technique. 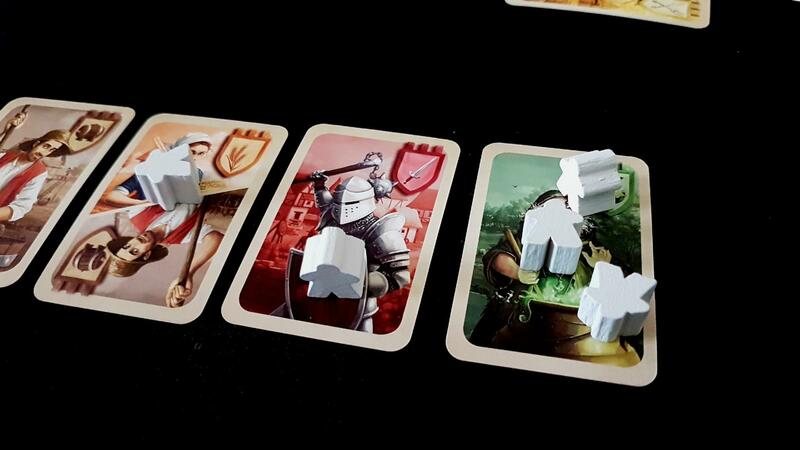 The worker meeples you get are a little fiddly, but not to the point it’s likely to be a problem since they are used only occasionally and only by dropping on cards. They can easily be replaced with more accessible tokens if they’re going to be a problem. All they do is act as a coinage. There’s no reason they need to be meeples at all. The primary physical interactions you have with the game are selecting a villager and placing it on its home location. Occasionally a villager is sent to the infirmary, or returned from the same. The rest of it is manipulating the points tokens which are both small enough to be frustrating and heavy enough to be awkward. You’ll be doing this a lot and I’d recommend using a more accessible alternative such as physical currency or poker chips. If play with verbalisation is necessary, the game lends itself well to instruction. Each card can be uniquely identified by name, and each villager can be uniquely identified by name or location. ‘Take card four and place it in my cottage’ for example. Some cards are split, able to act as two different villagers, and that represents the only occasion in which disambiguating cards and orientation may be required. I would have liked to have seen the art draw from a more diverse range of ethnicities but it at least does well on the male/female balance. Often in such cases a numerical split is undercut by the assignment of genders to roles, and here you might well argue that the ‘doctor’ being a witch and that witch being a woman is perhaps a little lazy. However, we also have a woman miller and a woman noble, compared to male brewers, guards and innkeepers. The knight is in platemail and it’s not possible to draw conclusions there. It might be Brianne of Tarth underneath, if you like. The box art puts a woman front and centre, and it’s nice to see a game where an uneven number of characters breaks for the women. Price-wise, well… it’s not great. Those weighted tokens obviously have an impact on the price because Majesty has an RRP of £37 and the box is full of enough air that it looks borderline deceitful. Once you’ve filled the box, you’re left with vast amounts of space that are clearly there just to puff it up on a game shop’s shelf. The tokens themselves are both wantonly extravagant and entirely unhelpful. I would have much rather seen a larger number of cheaper cardboard tokens than these – they feel nice, sure, but they just make play a chore. It makes it worse because you know that’s pretty much what you’re paying for. This is a game that could easily have fit in a box a quarter of the size and been a better game for it. Majesty plays up to four players, works well at two and three, but isn’t likely in my view to really warrant a place on your shelves. The experience is too samey, the possibility space too obvious, and the strategy too shallow. This is a game that’s worth playing because someone else bought it, not because you did. Still, it does well on the representation side and as such we’ll shake this out to a tentative recommendation overall. There is no need for literacy, although the names of buildings are written. That flavouring doesn’t have an impact on the game that isn’t already expressed in iconographic language. The game doesn’t require any formal communication either, so we’ll strongly recommend it in this category. Contrast might be an issue for players with an intersection of visual impairment and colour blindness, but not one that would invalidate our recommendations. It’s just something that may make some things a little more awkward than they could otherwise have been. There are enough channels of information that this is unlikely except in extreme circumstances to be a major problem. Visual impairments intersecting with cognitive impairments are likely to be an issue because of how much memory is going to be needed in order to compensate for the lack of visual state parsing. There are seven different locations each with precise effects, and a lot of the compensations from that depend on memorisation through familiarity. Were that to not be possible we’d have to revoke our recommendations in both of those categories. Otherwise, there are no obvious intersectional effects that will be a problem. Given the limited number of options you have on your turn even physical and communication impairments can intersect without concern. Exhaustive indication of options can be effectively leveraged. Games of Majesty are reasonably brisk, barring accessibility considerations. Around twenty to thirty minutes in my experience. It’s also reasonably amenable to players dropping out of play – there’s so little interaction in the game that all that changes is the tempo of turns. You could even simply take the first card on the offer and assign it to a dormant player’s tableau and have vanishingly little effect on the game state. That’s one of the reasons why we gave it such a muted review, but it does permit the game to be a safe choice for scenarios where discomfort or distress must be managed. Majesty may not have earned much praise in our review, but it does much better in this teardown. It gets recommendations, albeit sometimes only scraping them, across the board. Its price tag means it won’t be getting anywhere near our ‘accessible games on a budget’ list but still… it’s a relatively strong performance from an otherwise unremarkable game. I think there’s room here for a budget version of Majesty that uses cardboard tokens rather than plastic tokens, and that would actually impact positively on several grades here. More tokens of better denominations would be worth their weight in – well, weighted poker chips. 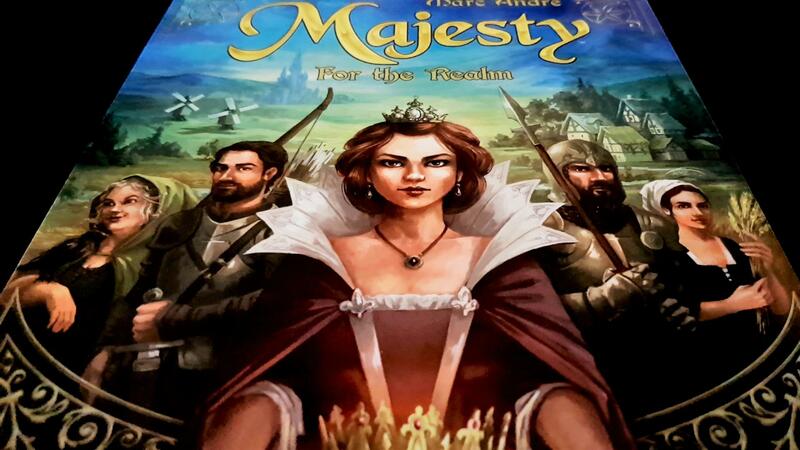 We gave Majesty two and a half stars in our review, not because it was bad but because it was ultimately unnecessary. Everything it does, other games do better and with more enthusiasm. Still, maybe those games aren’t accessible and under those circumstances Majesty might serve as a reasonable compromise.